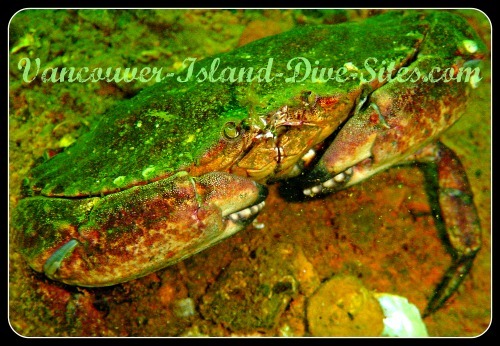 Elliot's Beach Park in Ladysmith, BC is a great dive location with excellent shore access from a southern exposure beach. Whatever your level of experience, this dive is worth checking out! Old school divers might still refer to this site as either Evening Cove or Shell Beach. Anyway, name it what you will, this spot is easily accessed as a shore dive, and is perfect for an evening dive because of the southern exposure. The dive here is not especially deep, 60ft. (18m) so it's just right for novice divers, but it is still interesting enough to attract even the advanced level diver. To get there find Brenton Page Road off of the Island Highway on the north side of Ladysmith. Turn onto this road and follow it for a couple of km's along until the road forks. Take the left fork in the road and you are now on Shell Beach Road. Stay on this winding road until the end and then follow the sign to the right to the beach parking lot. Lots of parking, and as noted, easy access! To do this beach dive just head straight away from the beach and when you hit 30ft. (9m) or so, begin to veer to your right. You know you are there at around the 40 to 50ft. (12-15m) mark. There you will find some rock shelves and lots of jumbled rock, where various aquatic creatures make their homes. Different varieties of rock fish, Shrimps, the odd East Pacific Red Octopus, and the largest Red Rock crabs we have ever seen can be found at this site. as if you are going around the corner towards Coffin Point. After a good swim of about 12 to 15 minutes, you will find some rock outcroppings and crevices in the 70ft. (21m) range. These outcroppings are interesting enough, but it is a long swim so make sure you are good on air.